But we wouldn’t talk about German grammar if there it wasn’t a lot more difficult than just that. On the one hand-side, German nouns change their forms depending on their grammatical case, on the other hand-side they change whether they are singular or plural. German nouns are, as a rare exception among the different languages on this earth, capitalized. That means: They are written with a capital letter at the beginning of the word. In many cases, German nouns are so called compound nouns. So, they consist of two or more smaller nouns sticked together. Well, articles in German always come together with their nouns. To get a better idea of that, just have a look on our text about German articles! As we cleared up some basics, let’s now go to some details about German nouns! So, as already mentioned above, German nouns vary in their form depending on their grammatical case. Of course, you already know the different cases in German. We’ve got nominative, genitive, dative and accusative. It is a bit confusing when you compare it to English, where actually no cases exist. Nevertheless it is no big deal getting into German cases and the connected German nouns when you put some effort in it! 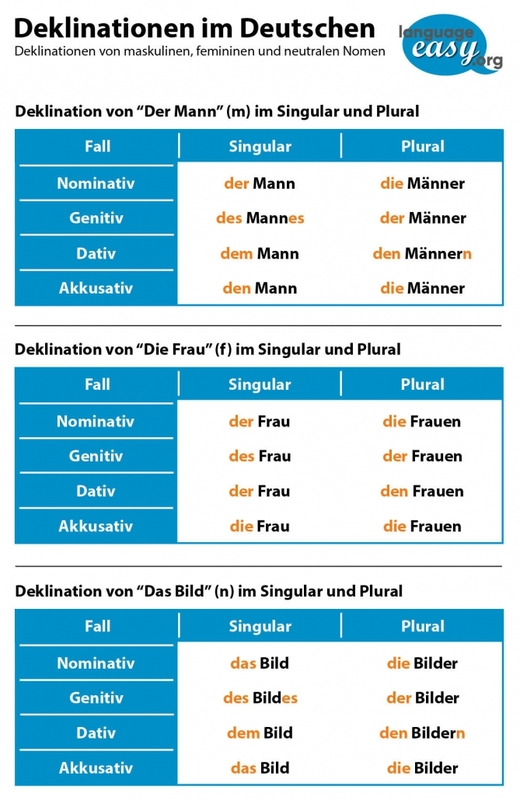 Well, let’s start right ahead with some tables that shows us how the German noun “der Mann” (the man), “die Frau” (the woman) and “das Bild” (the picture) vary. As you can easily see on the masculine, feminine and neuter article “der”, “die” and “das”, we have masculine, feminine and neuter noun. Of course it is singular, although I will show you their different plural forms aswell. Of course, It might seem to you that the gender of a noun vaires competlety randomly. But here is some good news: Luckily, there are certain rules that determine wheather a noun is masculine, feminine or neuter. Of course, there are exceptions, as you can find them in every language – don’t care too much and have a look on the following guidlines. Wordendings like -or, -ling, -smus or -ig are nearly every time masculine. Wordendings like -ung, -keit, -schaft, –tät, -ik, -tion, -heit or -ei are feminine. Wordendings like -chen, -ma, -um, -ment, -lein or -tum are neuter. Examples: das Mädchen (the girl), das Enigma (the enigma), das Judentum (the judaism), das Firmament (the firmament) are neuter. In case you have given the nominative singular, genitive singular, and nominative plural of a noun, it should be no problem for you to determine its declension. Mostly, all singular forms for feminine nouns are the same! In a great number of cases, German nouns in their Dative and Accusative forms do not take declension. – which basically means “Cattle Marking and Beef Labelling Supervision Duties Delegation Law”, ia the name of a law passed in the state of Mecklenburg-Vorpommern in the year 1999. Donaudampfschiffahrtsgesellschaft, which means “Danube Steamboat Shipping Company”. That’s a company that really exsited in the year 1829. Compared to the English language, German nouns, well, compound nouns are always written in one single word. In addition, we have a grammatical fenomena: the so called “Fugen-s”.